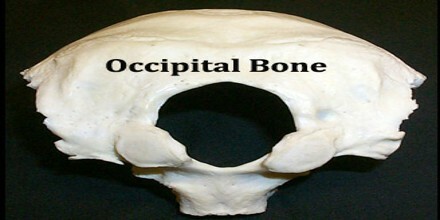 Occipital Bone is the saucer-shaped bone that forms the back part of the skull and part of its base. It is trapezoidal in shape and curved on itself like a shallow dish. The occipital bone overlies the occipital lobes of the cerebrum. At the base of the skull in the occipital bone there is a large oval opening called the foramen magnum, which allows the passage of the spinal cord. There are 206 separate bones in the human body. Collectively they form the skeletal system; a structure bound together by ligaments at the joints and set in motion by the muscles, which are secured to the bones by means of tendons. Bones, ligaments, muscles, and tendons are the tissues of the body responsible for supporting and moving the body. The basilar part is a thick, somewhat quadrilateral piece in front of the foramen magnum and directed towards the pharynx. This is also called the basioccipital. The lateral parts of the occipital bone are on either side of the foramen magnum and these are also called the exoccipitals. 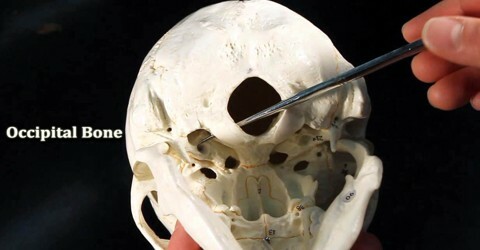 The squamous part is the curved, expanded plate behind the foramen magnum and is the largest part of the occipital bone. The occipital is cupped like a saucer in order to house the back part of the brain. It is one of seven bones that fuse together to form the skull and is directly next to five of the cranium bones. The foramen magnum houses the accessory nerves, which provide nerves to the neck and shoulder, the alar ligaments, which also help stabilize the head and neck, and the membrana tectoria a ligament that connects the spine to the occipital bone. Near the middle of the outer surface of the squamous part of the occipital (the largest part) there is a prominence – the external occipital protuberance. The highest point of this is called the inion. The inner surface of the occipital bone forms the base of the posterior cranial fossa. 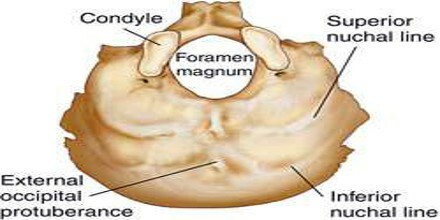 The foramen magnum is a large hole situated in the middle, with the clivus, a smooth part of the occipital bone travelling upwards in front of it. The median internal occipital crest travels behind it to the internal occipital protuberance, and serves as a point of attachment to the falx cerebri. This curved bone contains the foramen magnum, a large oval hole that allows the medulla oblongata to travel from the brain and connect to the vertebral canal. The medulla oblongata also contains the posterior spinal arteries and vertebral arteries, which supply blood to the brain. The occipital plane of the squamous part of the occipital bone is developed in membrane, and may remain separate throughout life when it constitutes the interparietal bone; the rest of the bone is developed in cartilage. It is said to be ossified from two centers and the basilar portion from one. As a person ages the occipital bone fuses with other bones of the cranium.